The Belmont – House Street area consists of a former licensed disposal facility owned and operated by Wolverine World Wide (Wolverine) at 1855 House Street in Plainfield Township, a suspected disposal area in the Wolven/Jewell area north of 10 Mile Road in Algoma Township, and MDEQ investigations into several citizen-reported unregulated dump sites across three townships in northern Kent County. Wolverine continued whole-house and point of use filter installations, sampling, and reporting. Wolverine submitted a "Draft Implementation of 2018 Work Plan Summary Report" to the USEPA on February 25, 2019 for review. MDEQ sent Wolverine a "Notice of expenditure of State Funds" letter on February 28, 2019. Wolverine provided a response to MDEQ's February 28 letter on March 8, 2019. Wolverine agreed to conduct drilling at 6 of the 11 proposed locations. On March 26, 2019, the USEPA and the MDEQ held a joint Town Hall at the Rockford High School Fine Arts Auditorium at 4100 Kroes Street NE, Rockford MI 49341. The Open House was from 6:00 – 6:30 pm, the Public Meeting from 6:30 – 8:00pm and time for questions held between 8:00 – 8:30pm. This meeting was originally scheduled for January 23, 2019, but was rescheduled due to the federal government shutdown. View the March 26 Town Hall presentation. Wolverine’s off-site groundwater investigation will continue in the House Street and Wolven/Jewell areas. Wolverine will continue the operation and maintenance of 537 whole-house filters and 235 point-of-use filters. Wolverine will continue monthly reporting to the MDEQ. Wolverine will continue weekly technical calls/meetings with the MDEQ regarding Wolverine’s investigation and response actions. 124 drinking water wells have been tested by MDEQ; 1,543 drinking water wells have been tested by Wolverine; 42 drinking water wells have been tested by Kent County Department of Public Works. Wolverine has provided 537 whole house filters and 235 point-of-use filters. Kent County Department of Public Works has provided 10 whole house filters. All households in the sampling areas (as shown on the figure above) have been offered bottled water and/or filters by Wolverine and/or Kent County Department of Public Works. The MDEQ has sampled all municipal water supplies for PFAS, including the City of Rockford and Plainfield Charter Township. View the City of Rockford and Plainfield Charter Township results. Groundwater and soil samples collected by Wolverine are still being tabulated. A final summary report of all the data collected by Wolverine this past summer, fall, and winter 2018 is due to the USEPA and MDEQ early Spring 2019. The following results reflect sampling efforts in the main areas of the site investigation. The sample totals listed below are reflected in the main results table above. Wolverine has sampled 564 homes. The MDEQ requested Wolverine to sample drinking water wells in the Wolven Northeast area to investigate if PFAS contaminated groundwater in the Wolven / Jewell area may be migrating preferentially to the northeast along a historic stream channel. MDEQ has sampled 21 homes. MDEQ has sampled 19 homes. Wolverine has sampled 691 homes. Wolverine has sampled 247 homes. The MDEQ has asked that Wolverine canvass and sample residential wells within the area from the former tannery property south to the Grand River within 1,500 feet of the Rogue River to the east and west. Kent County Department of Public Works has sampled 42 homes. In addition to the PFAS investigations, the MDEQ responded to citizen complaints regarding alleged disposal areas at additional locations. As of January 2019, the MDEQ has conducted and completed investigations at a total of 109 alleged source areas. Shown below are summaries for five of the investigations that included drinking water well sampling. These investigations did not identify PFAS disposal areas, and sample results from all homes were below 70 ppt PFOA+PFOS. 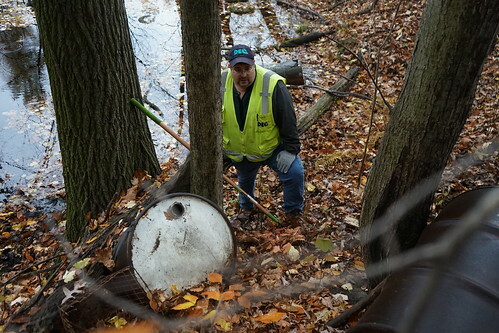 View photos of DEQ investigation of potential PFAS contamination. For additional assistance, please email the Environmental Assistance Center or call 800-662-9278. If you live in the designated study area and would like free water testing, please fill out and send this Request of Water Testing email form. If you live near an area that you believe may be a suspected Waste Disposal Area, please fill out and send this Suspected Waste Disposal Area email form. Residents please note: Many residents have inquired about which whole house filters are certified to remove PFOS/PFOA. At this time, the DEQ is not aware of any whole house filters currently on the market that are certified to remove PFOS/PFOA by the NFS International. This area consists of a former licensed disposal facility owned and operated by Wolverine World Wide (Wolverine) near House Street and Herrington Avenue in Plainfield Township, and Michigan Department of Environmental Quality (MDEQ) investigation into several citizen reported unregulated dump sites across three townships in northern Kent County. On January 24, 2017, a concerned citizens group brought the former House Street disposal location to the MDEQ’s attention on January 24, 2017. In response to these concerns, the MDEQ requested that Wolverine sample residential wells. In May 2017, the MDEQ received results from Wolverine from the requested residential well sampling. Levels of PFOA and PFOS were detected over the USEPA Lifetime Health Advisory of 70 ppt PFOA and PFOS individually or combined. In August 2017, Wolverine began its on-site groundwater investigation on the House Street Dump Site, which has expanded off-site in order to define the full extent of the PFAS contamination. This investigation is still ongoing, and more work is needed by Wolverine to fully define and monitor the plume long term. In Fall/Winter 2017, per a request by the school district, the water at several Rockford Public Schools was tested. The results were non-detect. Beginning in the Winter of 2017, Wolverine has been conducting off-site groundwater environmental investigations in the Wolven/Jewell source area (located north of 10 Mile and west of Wolven Ave). In January 2018, MDEQ filed a legal complaint against Wolverine under the federal Resource Conservation and Recovery Act (RCRA) and state law, including Part 201 (Environmental Remediation) in the United States District Court for the Western District of Michigan.In the complaint, the state seeks orders that Wolverine institute protective measures to mitigate risks to public health, continue environmental investigations, address PFAS contamination in ground and surface water and pay for the state’s past and future costs associated with enforcement of state clean-up laws. In late Spring 2018, Wolverine began conducting a source area investigation on the House Street site under a United States Environmental Protection Agency (USEPA) Unilateral Administrate Order (UAO) to address the non-PFAS contamination, and is sampling for PFAS for the MDEQ as part of those investigation activities.This investigation was completed in late November 2018, with a summary report due to the agencies in late February 2019. On July 31, 2018, Rockford Public Schools were tested again as part of the MPART statewide sampling efforts. Results were non-detect. The MDEQ has provided oversight of Wolverine’s activities, conducted follow-up groundwater monitoring sampling, sampled 124 residential drinking water wells, provided residents with bottled water, investigated over 100 citizen-reported disposal locations, implementing a hydrogeologic groundwater investigation in the North Childsdale sampling area and areas east of the Rogue River. On November 3, 2018, the MDEQ completed reviewing Wolverine’s revised filter operation and maintenance plan and provided comments back. On November 21, 2018, the MDEQ requested Wolverine resample all residential drinking water wells in current sampling areas in a letter dated 11/21/18. Wolverine responded to this request on January 18, 2019. In November 2018, Wolverine completed field work for House Street and MDOT property on-site investigations (reporting due to the MDEQ/USEPA starting January 22, 2019). In late November 2018, the USEPA and the MDEQ released a status update factsheet, providing residents an update on the investigation and announcing the January town hall meeting. On December 10, 2018, the MDEQ collected whole house filter split samples with GZA, Wolverine’s consultant. On January 2, 2019, Wolverine began installing a new monitoring well location in the Wolven/Jewell Area. On January 10, 2019, the MDEQ announced that the originally scheduled January 23, 2019 joint USEPA/MDEQ townhall was postponed due to the federal government shutdown. On January 18, 2019, Wolverine responded to the November 21 resampling request with an alternate resampling plan, which it is currently implementing. As of January 30, 2019, Wolverine has sampled over 1,540 residential drinking water wells, provided residents with bottled water, installed 235 point-of-use filters and 536 whole-house treatment systems, removed barrels and subsurface waste at two locations near the House Street disposal site, and is implementing an environmental investigation of groundwater contamination at the House Street site and its surrounding area.